Today’s Throwback Thursday is not quite as old as some of the polishes previously featured, but it’s a fairly well-known shade that I just about deem a classic, by now. 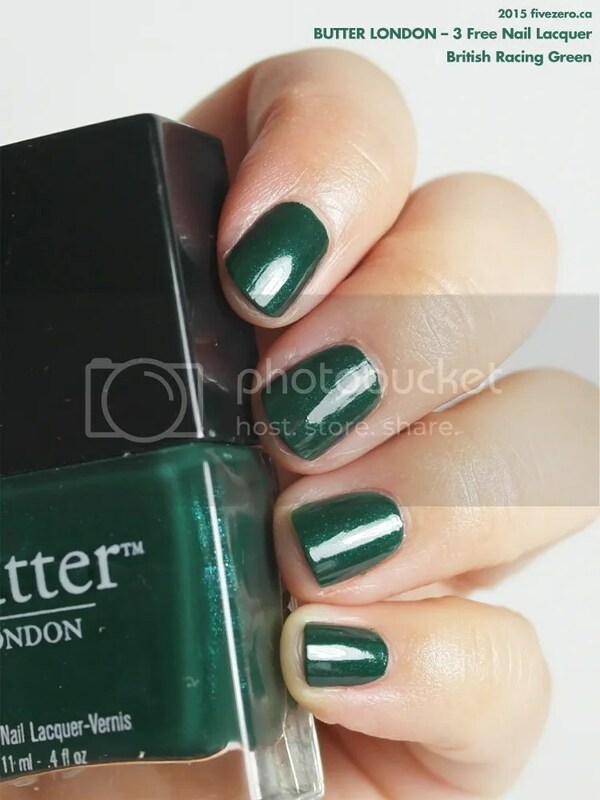 British Racing Green was launched in the fall of 2009 as part of a collection of polishes that butter LONDON created for New York Fashion Week. “Hand mixed by our very own Creative Director Nonie Creme for the Vena Cava show” (butterlondon.com), it’s a deep, vampy jewel-toned green with subtle shimmer. 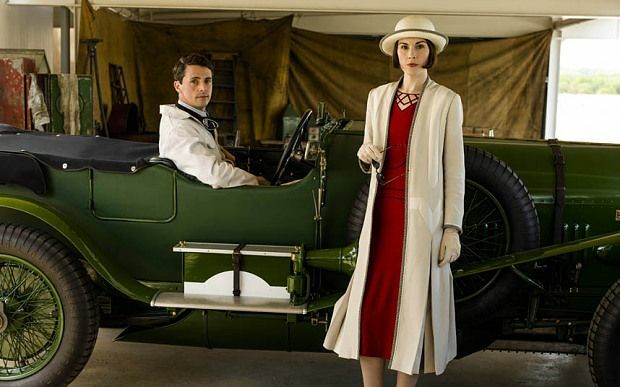 This elegant shade is named for the shades of green used in British auto racing since 1903—usually a deep forest green. I’m not a driver and I know next to nothing about cars, but if I ever had to get a car, it’d be a deep green like this polish. And be an E-Type. I can dream, right? This polish has been in my collection for several years, and it’s still in great shape. Two coats are easily applied for full opacity. The lush green pigmentation is out of this world! The shimmer is subtle, but still gives the polish a lot of depth on the nail. It dries to a fairly glossy finish. Strangely, though the polish is 3 Free, it does have a strong, chemical-y odor. I can’t remember if it always had that, though. British Racing Green is definitely one of the best vampy green polishes in my collection, and I wouldn’t ever want to be without a bottle! butter LONDON 3 Free Nail Lacquer is US$15 / CA$18 and is 0.4 US fl oz / 11 mL. The lacquer does not contain toluene, formaldehyde, or dibutyl phthalate (DBP), and is made in the USA. It’s definitely one of my fave greens! oh my gosh! My dream car is a deep green Jag too! I’m not even kidding. I’ve even told people and they thought I was weird! I think I saw one when I was young and thought it looked so posh. I’m not even THAT much of a fan of green usually. This polish colour is really classy – I would even consider wearing something like this to work on my fingers! Hahaha, no way! I actually saw a dark green Jag yesterday, too. Very weird, as I haven’t seen one for ages. It wasn’t one of the cool ’60s styles, though. I’ve always loved this color! Such a classic colour! Love it! Everybody needs a dark green! Bet it’d come in handy for nail art, too. There are a lot of nice options – do you have a shortlist yet? I usually just screenshot the ones I like from the greens you post! Love it – one of my favourite colours of all time. And yes – a Jag in British Racing Green just screams “class and elegance”!! Not into the all-year-round Santa look? LOL! It won’t feel as special once Christmas actually rolls around, y’know? !